Looking for an easy and healthy dinner idea... I love Cauliflower "rice" it not only gives me my take-out food fix but preparing it almost as fast as going to pick up take out. It only has 20 calories per cup (plain) and is packed with vitamins and nutrients. It's way lower in carbs than white or even brown rice and prepared in one of the recipes below you won't miss rice at all. 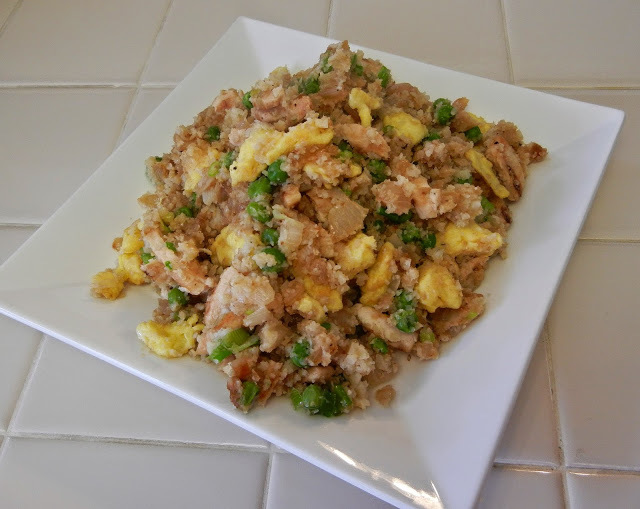 Cauliflower rice is really a blank canvas so it's easy to adjust one of these recipes to the ingredients you have on hand. It's a great way to save money and use up any leftovers. 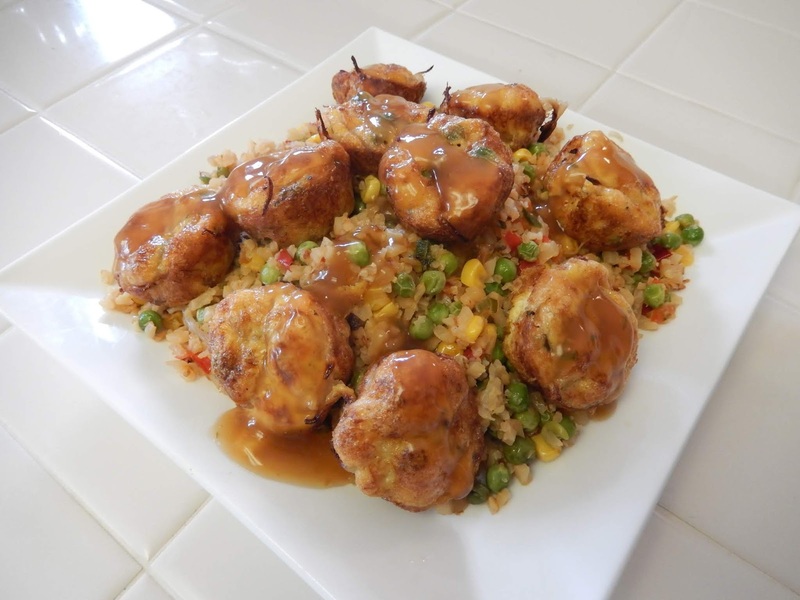 You can break-up a head of cauliflower into florets and pulse the florets a few at a time in a food processor until reduced to the size of rice grains or use pre-riced cauliflower (fresh or frozen) which is way less work and less cleanup. If you have a Trader Joe's around they carry both the fresh and frozen pre-riced cauliflower. Most major supermarkets carry them as well as larger stores like Walmart and Target. 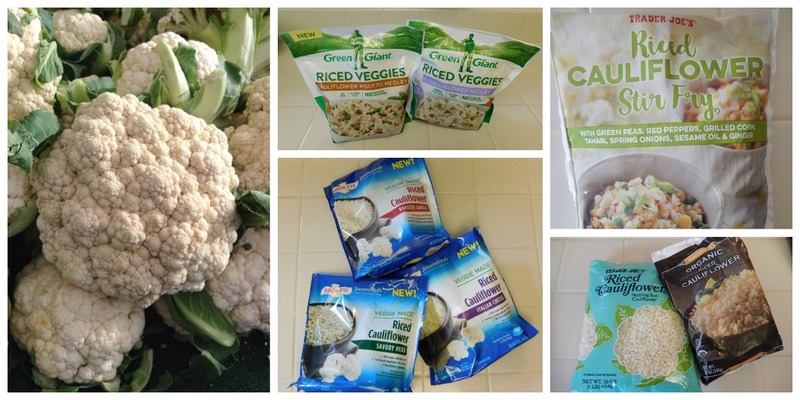 A favorite of mine is Green Giant steamer bags of riced cauliflower, plain or some have added veggies. Birds Eye has some steamer bags that are seasoned. Steamer bags make dinner super easy because there is less to clean-up. You'll just need to adjust cooking times for fresh versus frozen. From fresh: Saute with a drizzle of olive oil for 8-10 minutes, stirring occasionally till the cauliflower "rice" becomes slightly golden then saute in the pan with other ingredients. From frozen: Microwave (or cook) as package directs then saute the "rice" in the saute pan with other ingredients. 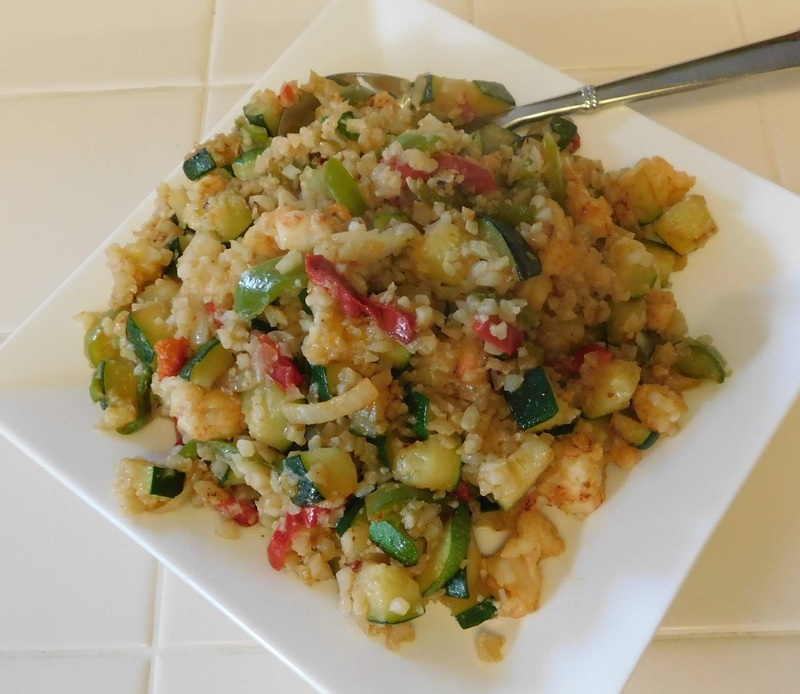 Shelly's Fajita Shrimp Fried Riceless "Rice"
Microwave cauliflower rice steamer bag per package directions and set aside. Saute onions, peppers, and diced zucchini in a drizzle of olive oil till tender and slightly golden. Add seasoning and shrimp until they just turn pink, 3 to 5 minutes depending upon their size. I like to chop the shrimp a bit so more bites have shrimp in them and they cook faster. You can leave them whole if you prefer. Add steamed cauliflower "rice" to the pan and stir till well combined. Cook till warmed through. Add salt to taste. 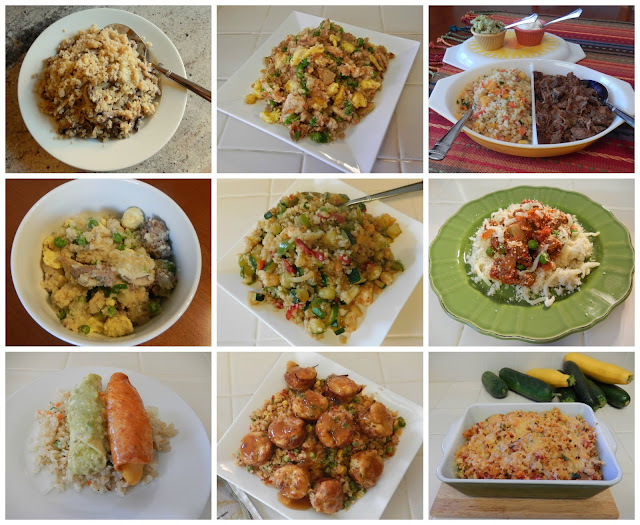 Hope these inspire you to create some cauliflower rice creations of your own. If you post them online tag them #Eggface so others can check them out.